Tractor hydraulic fluids (THF) are used to lubricate hydraulic systems, brakes, and certain other systems in farming, construction and logging equipment. Prior to 1974, John Deere manufactured and sold a multi-use THF called JD 303. The 303 fluid contained sperm whale oil, which was banned from use in the mid-1970s. As a result, John Deere discontinued production of the 303 fluid and the 303 designation became obsolete. Over the years that followed, John Deere developed and improved on several other specifications for its tractor hydraulic fluids; the current specification is referred to as J20C. Although the 303 designation has been obsolete for more than 40 years and the original specification is unknown, certain lubricant manufacturers and sellers have been using the old John Deere 303 name and producing and selling THF as 303 in bright yellow buckets at various farm and manufacturing supply stores in Missouri and throughout the United States. The mislabeled THF often fails to meet any manufacturers’ specifications and is typically made with inferior component products not appropriate for use in a tractor hydraulic fluid. These mislabeled 303 fluids can cause harm, increased wear and damage to consumers’ equipment. 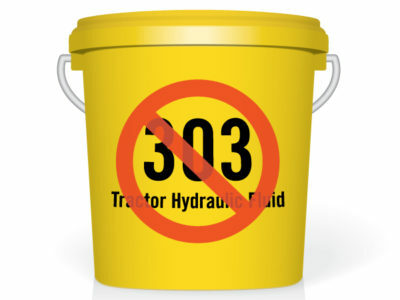 In November 2017, the State of Missouri banned the sale of these “yellow bucket” THF products labeled as 303 fluids. White, Graham, Buckley & Carr, L.L.C. 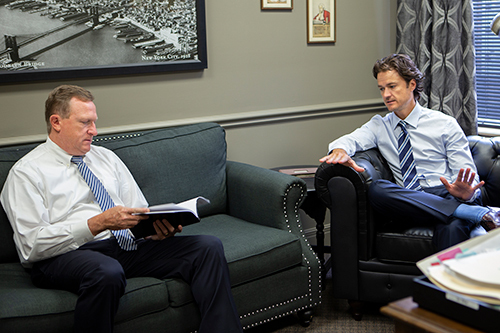 was the first to pursue the litigation, which was featured in a Kansas City Business Journal article, Sale of Hydraulic Fluid Spurs Call for Class Action. Learn more about our class action work to address the damages caused by 303 THF here. If you would like to speak to one of our attorneys about potential 303 tractor hydraulic fluid litigation, contact us today. Hornbeck v. Tractor Supply Company: Like many other consumers throughout Missouri, prior to the State of Missouri’s ban the plaintiffs in this class action purchased a 303 THF product called Super S Super Trac 303 Tractor Hydraulic Fluid at Tractor Supply Company retail stores. The Super S Super Trac 303 THF was manufactured by Smitty’s Supply, Inc. and was advertised to assist with anti-wear properties, brake chatter, extreme pressure properties, foam suppression, PTO clutch performance, rust protection, and water sensitivity. The 303 THF product was used by plaintiffs on equipment, including John Deere Skid Steer Loader Hydraulic System, 1944 John Deere B Tractor, 1950 John Deere 50 Tractor, Hay Wagon Lift Cylinder, Log Splitter Hydraulic Tank, 1952 Chevy Grain Truck Lift Cylinder, and 1958 International Dump Lift System. The plaintiffs allege the labeling of the product was deceptive and misleading, and that the product exposed their equipment to increased wear and damage. Miller v. O’Reilly Automotive, Inc.: Similar to the above case above, prior to the State of Missouri’s ban the plaintiffs purchased mislabeled 303 THF products, specifically O’Reilly 303 Tractor Hydraulic Fluid, for O’Reilly retail stores.. The plaintiff allege the defendants’ THF did not meet manufacturer specifications and as fluids that are safe for use in farm, construction and logging equipment and have certain characteristics and qualities that protect equipment from wear and damage. By naming, labeling, marketing, advertising and selling the 303 THF product in such a misleading manner, and by describing the product using words such as “multi-service” and “excellent performance,” plaintiff allege the defendants led them to conclude that defendants’ 303 THF was completely safe and effective for use in consumers’ equipment and all equipment made by the listed manufacturers. The plaintiffs allege damage to their equipment, including excessive wear, leakage in the seals, exposure to spiral gear damage, improper and poor shifting, wear and damage to the wet brakes, high pump leakage, and damage from deposits, sludging and thickening. Hornbeck v. Orscheln Farm and Home: Prior to the State of Missouri’s ban, the plaintiffs in this case, purchased defendant Citgo Petroleum’s Premium 303 Tractor Hydraulic Fluid and its MileMaster 303 Tractor Hydraulic Fluid sold by defendant Orscheln Farm and Home retail stores in Cass County and throughout the State of Missouri. Similar to the cases above, the defendants’ 303 THF product did not meet the specifications of the other manufacturers defendants list on the labels and advertising of their 303 THF product. Prior to the filing of a class action petition, Orscheln sold and advertised 303 THF Products in yellow buckets as a fluid designed for use in equipment manufactured by Allis-Chalmers, Massey Ferguson, Deutz, JI Case/David Brown, Allison, International Harvester, White, Kubota, John Deere, Oliver, Ford and Caterpillar. Perilously Obsolete: the Dangers of 303 Tractor Hydraulic Fluids: TractorLife.com details the reasons 303 Tractor Hydraulic Fluids (THFs) are obsolete and discusses Missouri and Georgia banning the sale of products labeled as 303 THF. Sale of Hydraulic Fluid Spurs Call for Class Action: The Kansas City Business Journal discusses the lawsuit brought forth in Cass County against Tractor Supply Co. WGB&C is featured in this article. Missouri Orders 303 Tractor Hydraulic Fluids Out of the State: The Petroleum Quality Institute of America’s blog outlines the reasons why the State of Missouri Department of Agriculture Weights, Measures & Consumer Protection Division ordered that Tractor Hydraulic Fluid (THF) labeled as 303 can no longer be sold in the state. Georgia Issues Stop Sale Order for All J303 Tractor Hydraulic Fluid: The Petroleum Quality Institute of America’s blog details the Georgia Department of Agriculture, Fuel & Measures Division issuing a “Stop Sale Order” for Tractor Hydraulic Fluids (THF) products in the market labeled, claimed or implied as meeting the THF 303 specification. Suppliers Sued Over 303 Tractor Fluids: Lubes’N’Greases outline the class action lawsuit against Smitty’s Supply Inc. and Tractor Supply Co. by two Missouri residents, claiming yellow buckets of Smitty’s Super S Supertrac 303 Tractor Hydraulic Fluid (THFs) failed to meet advertised specifications and performance claims. Missouri Bans “JD 303” Tractor Hydraulic Fluid: MFA Oil’s Fueled blog details the Missouri Department of Agriculture barring the sale of Tractor Hydraulic Fluid (THF) labeled as “John Deere 303” effectively immediately. Georgia Issues 303 Tractor Hydraulic Fluid Stop Sale Order: The Independent Lubricant Manufacturers Association’s newsletter discusses Georgia becoming the second state to issue a “Stop Sale Order” for Tractor Hydraulic Fluids (THFs) labeled as meeting the obsolete “John Deere 303” specification. Georgia Issues Stop Sale Order for All J303 Tractor Hydraulic Fluid: Jobbers World blog outlines Georgia issuing a stop sale order for all J303 Tractor Hydraulic Fluids (THF) products in the market labeled, claimed or implied as meeting the 303 specification. North Carolina Issues Stop-Sale Order on J303 Tractor Hydraulic Fluid: The Petroleum Quality Institute of America’s blog outlines the North Carolina Department of Agriculture and Consumer Services (NCDA&CS) issuing a “Stop Sale Order” for Tractor Hydraulic Fluid (THF) products labeled, claimed or implied as meeting THF 303, which has no known specifications available. NCDA&CS Issues Stop Sale Order on Tractor Hydraulic Fluid J303: The Richmond Observer details the N.C. Department of Agriculture and Consumer Services issuing a “Stop Sale Order” for Tractor Hydraulic Fluid (THF) products labeled, claimed of implied as meeting THF 303. NCDA&CS Issues Stop Sale Order on Tractor Hydraulic Fluid J303: Watauga Online published a press release detailing the N.C. Department of Agriculture and Consumer Services issuing a “Stop Sale Order” for Tractor Hydraulic Fluid (THF) products labeled, claimed or implied as meeting THF 303 specifications. Playing Roulette with 303 Yellow Buckets The Stakes Are High and the Odds Are Not in Your Favor: the Petroleum Quality Institute of America’s bulletin details the data behind 303 Tractor Hydraulic Fluid (THF) and the damages it causes. North Carolina Issues a Stop-Sale Order on 303 Tractor Hydraulic Fluid: Jobbers World blog outlines North Carolina issuing a “Stop Sale Order” on 303 Tractor Hydraulic Fluid (THF). NCDA&CS Issues Stop Sale Order on Tractor Hydraulic Fluid J303: Morning Ag Clips outlines the N.C. Department of Agriculture and Consumer Services has issued a “Stop Sale Order” for Tractor Hydraulic Fluid (THF) products labeled, claimed or implied as meeting THF 303, which has no known specifications available. North Carolina Department of Agriculture and Consumer Services (NCDA&CS) Issues Stop-Sale Order on Tractor Hydraulic Fluid J303: The N.C. Department of Agriculture and Consumer Services has issued a stop-sale order for tractor hydraulic fluid products labeled, claimed or implied as meeting THF 303, which has no known specifications available. The Missouri Department of Agriculture (MDA) Removes 303 Tractor Hydraulic Fluids From Sale, 303 Manufacturers Recall Product: Missouri retailers of 303 Tractor Hydraulic Fluid (THF) have been notified by the Department that these products are misbranded because they fail to meet any current tractor manufacturer’s specifications.